The Weinstein Company opens Clown at Village East Cinemas and on VOD on June 17th, 2016. NYC MOVIE GURU: What do you think is so appealing about dark themes? Laura Allen: It challenges us to go to the extremes of a dark place and imagine, "What would I do in these circumstances?" Sometimes we're put in situations where we have to make very hard choices---especially like with the character of Meg in Clown. She's a normal woman, a mother, a dental hygienist, she's in a marriage that's flawed, and has her dad watching over her. At the end of the movie, she's asked to go to horrific places and make tough choices for her survival of herself and her unborn child. NYC MOVIE GURU: To what extent did you judge the character of Meg while reading the script? LA: In the initial reading for Clown, I found her to be very relatable at the beginning. At the time, too, I was a mother of 3-month-old boy. A storm knocked out the power in my hotel, and I was reading about Meg without electricity. Her decisions are reactive, and she's emotional. All I care about is that I'd do anything to keep my baby safe. Meg will go to places that she never would have imagined. I just had to keep asking myself, "What would it take for myself to do these things?" NYC MOVIE GURU: How do you imagine Meg dealing with her horrific experiences later on in life? Given your experience as a domestic violence counselor, what advice would you give to Meg? LA: Meg is a mother, and has a big love for her son and her husband. I really believe that she held onto hope for him for recovery for as long as possible. When she has to do what she has to do at the end, I'm sure that later on she'd have to deal with Post-Traumatic Stress. I'm a mother who's terrified of flying. When I get onto a plane with my child, somehow my primal fear goes away because I have to look after this person that's next to me. I would imagine that Meg, going forward after the movie, is focused on making sure that the demon doesn't transfer to some other creature, and that she would keep her son and new baby safe. She lost her husband, but after going through all that I think she'll get over it quickly. NYC MOVIE GURU: What questions would you ask Meg if she popped into real life? LA: I'd be curious about her spiritual life and to know if she had something guiding her spiritually, and how she could find that spirituality when she had to do what she had to do at the end of the movie. When you talk about the demon in a horror movie, no one goes to a priest and nobody talks about holy water. I wonder if she was resolved about her questions of faith in the movie. NYC MOVIE GURU: How do you feel about the abundance of movies that can be turned into video games in our current film industry? LA: It would complicate the situation because she's also carrying a child. How could he kill the demon while saving her child? He can't kill the her. So, I think that they're both very rational characters, so they would try to resolve it in the best possible way. NYC MOVIE GURU: To what extent do you believe in the supernatural? LA: I spent time working in New Orleans, and I will tell you that in the hotel in the French Quarter, there's a presence. I felt surrounded by something. I don't know what to call it. I'm not so arrogant to think that there couldn't be some other realm. 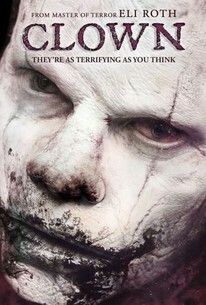 NYC MOVIE GURU: How challenging is it to find work in films like Clown that are grounded in humanism? LA: You bring up a really good point because that's what appealed to me about the character initially. Clown starts out as a family drama with relatable characters much like The Exorcist---and The Exorcist might be my favorite horror film. We end up character about these characters, and that's set up very early on so that when things start to go awry, you want it back as you watch them struggle. These are real characters in very strange circumstances. It is hard to find these kind of scripts. I'm not all that familiar with the horror genre, but horror films can kind of get lost in their own mythology and in special effects, so as an actress I think I got lucky with this one. NYC MOVIE GURU: Are there any directors you wish you could work with either from the Golden Age of American Cinema or today? How challenging is it to find complex film roles as an actress? LA: Who wouldn't want to work with Billy Wilder? One of my favorite directors who I hope to work with one day is Ang Lee. I'm lucky that I'm in a sort of Golden Age of Television. It's a long form of storytelling. You get to work with great screenwriters and directors, and you carry the story and get to know the character from episode to episode. There are so many superhero films, but as an actress, I'd rather have a long form of storytelling. NYC MOVIE GURU: Would Clown work in black-and-white, artistically? LA: I love that idea! You reminded me of a suspense thriller called Wait Until Dark. It's a black-and-white film that I thought was very terrifying. Yes, you're right, black-and-white can be even scarier, but I know that it's not commercially preferred. I'd love to see Clown in black-and-white. NYC MOVIE GURU: What films would make a great double feature with Clown? LA: Some people have compared Clown to David Cronenberg's The Fly in the same way that there's a transformation of a character who's aware that he has a conscience. One of my all-time favorite movies is The Shining. I love the female character in that film. NYC MOVIE GURU: What about something more upbeat? LA: The Dark Knight is relatively upbeat.